Known as the crown to the Valley of Angels, the peaks of the San Gabriel Mountains frame the Los Angeles skyline. Over 15 million people live within 90 minutes of this island of green, which provides 70 percent of the open space for Angelenos and 30 percent of their drinking water. Millions recreate and rejuvenate in the San Gabriels each year, seeking out their cool streams and canyons during the hot summer months, their snowcapped mountains in the winter, and their trail system and historic sites throughout the year. The San Gabriels are some of the steepest and most rugged mountains in the United States. Situated adjacent to the mighty San Andreas Fault, the mountains are geologically active, migrating northwest at an average of 2 inches each year. Deep canyons, many with precious perennial streams, score the mountain peaks — north toward the arid Mojave Desert and south to the temperate San Gabriel Valley. The rich cultural history of these mountains echoes their striking geologic features and ecological diversity. Cultural resources represent successive layers of history, including that of Native Americans, Spanish missionaries and colonialists, Mexican rancheros, and Euro-American settlers and prospectors. Native American history runs deep, at least 8,000 years, exemplified by the Aliso-Arrastre Special Interest Area known for its heritage resource values, including several rock art and cupules features, the concentration of which is unique to southern California. Due to urban development and natural processes, this area also contains the best preserved example of a Gabrielino pictograph that characterizes the California Tradition of rock painting. Early European explorers' use of the area consisted mainly of early explorers traveling through the area. Over time, land grants, Spanish missions, and townsites surrounded the mountains, relying heavily on them for water, building supplies, and game. By the 1840s, gold prospectors poured into the mountains. Large placer and lode mining operations were established in the San Gabriels, with mixed success. The historic mining town of Eldoradoville, located along the East Fork of the San Gabriel River, had at its peak in 1861 a population of over 500 miners, with general stores, saloons, and dance halls along with numerous mining camps of tents, wooden shacks, and stone cabins along the river. In the early 20th century, responding to the burgeoning interest of urban dwellers in backcountry hiking and weekend rambling, a number of trails, lodges, and camps — many of which were accessible only by horseback or on foot — were constructed throughout the mountains. Remnants of these historic resorts, which attracted local residents and Hollywood stars alike, can still be seen and are important aspects of the region's social and cultural history. Enthusiasm for recreating in the mountains continues today. The San Gabriels offer hundreds of miles of hiking, motorized, and equestrian trails, including several National Recreational Trails and 87 miles of the Pacific Crest National Scenic Trail. In the footprint of the resorts of the Great Hiking Era, many visitors partake of Forest Service campgrounds built on the foundations of early 20th-century lodges and resorts. In a region with limited open space, the mountains are the backyard for many highly urbanized and culturally diverse populations within Los Angeles, underscoring the need for strong partnerships between this urban forest and neighboring communities. The mountains have hosted world-class scientists, studying the terra firma at their feet as well as the distant galactic stars. Astronomer Edwin Hubble performed critical calculations from his work at the Mt. Wilson Observatory, including his discovery that some nebulae were actually galaxies outside our own Milky Way. Assisted by Milton Humason, he also discovered the presence of the astronomical phenomenon of redshift that proved the universe is expanding. Also on Mt. Wilson, Albert Michelson, America's first Nobel Prize winner in a science field, conducted an experiment that provided the first modern and truly accurate measurement of the speed of light. Closer to earth, the San Dimas Experimental Forest, established in 1933 as a hydrologic laboratory, continues the study of some of our earliest and most comprehensively monitored research watersheds, providing crucial scientific insights. Although proximate to one of America's most urban areas, the region has untrammeled wilderness lands of the highest quality, including four designated wilderness areas: San Gabriel, Sheep Mountain, Pleasant View Ridge, and Magic Mountain. These lands provide invaluable backcountry opportunities for the rapidly expanding nearby communities and also provide habitat for iconic species including the endangered California condor and least Bells' vireo, and the Forest Service Sensitive Nelson's bighorn sheep, bald eagle, and California spotted owl. Inventoried roadless areas and lands recommended for designation as Wilderness also provide important habitat, including a connectivity corridor important for wide ranging species, such as the mountain lion. The importance of the San Gabriels' watershed values was recognized early. As early as the late 1800s, local communities petitioned to protect the mountains for their watershed values. As a result, President Benjamin Harrison established the San Gabriel Timberland Reserve in 1892, the precursor to the Angeles National Forest. Reflecting the needs of the nearby population centers, the San Gabriels host an array of flood control and water storage, delivery, and diversion infrastructure, including six large retention dams as well as numerous telecommunications and utility towers. The San Gabriels' rivers not only provide drinking water but are also areas of high ecological significance supporting rare populations of native fish, including the threatened Santa Ana sucker. The San Gabriel River supports rare arroyo chub and Santa Ana speckled dace, a species found only in the Los Angeles Basin. Little Rock Creek tumbles down from the northern escarpment to the Mojave Desert below and supports important populations of the endangered mountain yellow-legged frog and arroyo toad, as well as the threatened California red-legged frog. On the slopes of Mt. San Antonio, San Antonio Creek rushes through an alpine canyon studded with stalwart bigcone Douglas fir, and the magnificent 75-foot San Antonio Falls draw thousands of visitors every year. In addition to rivers, the San Gabriels contain two scenic lakes, both formed by the area's remarkable geologic forces. The alpine Crystal Lake, found high in the mountains, was formed from one of the largest landslides on record in southern California. Jackson Lake is a natural sag pond, a type of pond formed between the strands of an active fault line — in this case, the San Andreas. Climatic contrasts in the San Gabriels range from the northern slope desert region, home to Joshua trees and pinyon pines, to high-elevation white fir and a notable stand of 1,000-year-old limber pines. Vegetation communities, including chaparral and oak woodland, represent a portion of the rare Mediterranean ecosystem found in only 3 percent of the world. Mediterranean climate zones have high numbers of species for their area. The San Gabriels also provide suitable habitat for 52 Forest Service Sensitive Plants and as many as 300 California-endemic species, including Pierson's lupine and San Gabriel bedstraw, that occur only in the San Gabriel range. The mountains harbor several of California's signature natural vegetation communities, including the drought-tolerant and fire-adapted chaparral shrubland, which is the dominant community and includes scrub oaks, chamise, manzanita, wild lilac, and western mountain-mahogany. Mixed conifer forest is an associated vegetation community comprising Jeffrey pine, sugar pine, white fir, and riparian woodlands including white alder, sycamore, and willow. These communities provide habitat for numerous native wildlife and insect species, including agriculturally important pollinators, the San Gabriel Mountains slender salamander, San Bernardino Mountain kingsnake, song sparrow, Peregrine falcon, mule deer, and Pallid bat. NOW, THEREFORE, I, BARACK OBAMA, President of the United States of America, by the authority vested in me by section 2 of the Antiquities Act, hereby proclaim the objects identified above that are situated upon lands and interests in lands owned or controlled by the Government of the United States to be the San Gabriel Mountains National Monument (monument) and, for the purpose of preserving those objects, reserve as a part thereof all lands and interests in lands owned or controlled by the Government of the United States within the boundaries described on the accompanying map entitled, "San Gabriel Mountains National Monument" and the accompanying legal description, which are attached to and form a part of this proclamation. These reserved Federal lands and interests in lands encompass approximately 346,177 acres, which is the smallest area compatible with the proper care and management of the objects to be protected. All Federal lands and interests in lands within the boundaries of the monument are hereby appropriated and withdrawn from all forms of entry, location, selection, sale, leasing, or other disposition under the public land or other Federal laws, including location, entry, and patent under the mining laws, and from disposition under all laws relating to mineral and geothermal leasing, other than by exchange that furthers the protective purposes of the monument, or disposition of materials under the Materials Act of 1947 in a manner that is consistent with the proper care and management of the objects protected by this proclamation. The establishment of this monument is subject to valid existing rights. Lands and interests in lands within the monument's boundaries not owned or controlled by the United States shall be reserved as part of the monument upon acquisition of ownership or control by the United States. To the extent allowed by applicable law, the Secretaries of Agriculture and the Interior shall manage valid Federal mineral rights existing within the monument as of the date of this proclamation in a manner consistent with the proper care and management of the objects protected by this proclamation. Nothing in this proclamation shall be construed to alter the valid existing water rights of any party, including the United States. Nothing in this proclamation shall be construed to interfere with the operation or maintenance, nor with the replacement or modification within the existing authorization boundary, of existing water resource, flood control, utility, pipeline, or telecommunications facilities that are located within the monument, subject to the Secretary of Agriculture's special uses authorities and other applicable laws. Existing water resource, flood control, utility, pipeline, or telecommunications facilities located within the monument may be expanded, and new facilities may be constructed within the monument, to the extent consistent with the proper care and management of the objects protected by this proclamation, subject to the Secretary of Agriculture's special uses authorities and other applicable law. 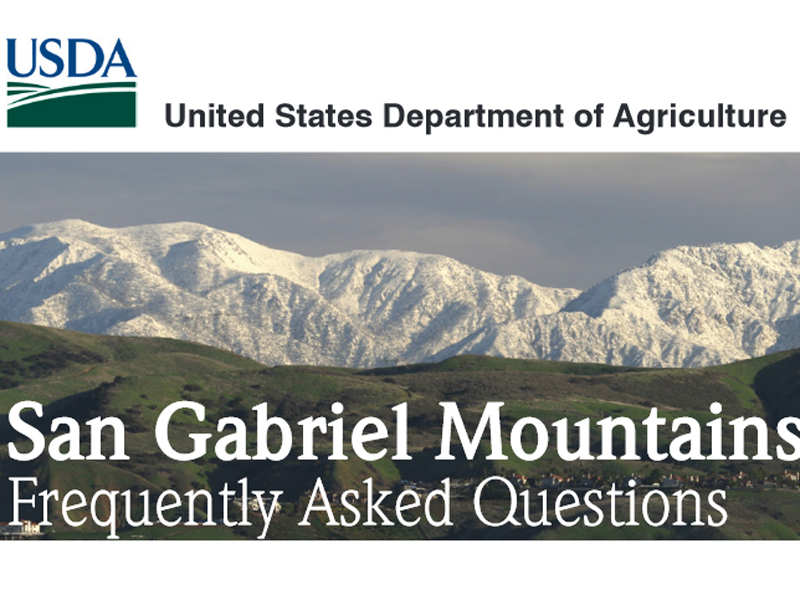 The Secretary of Agriculture (Secretary) shall manage the monument through the Forest Service, pursuant to applicable legal authorities, consistent with the purposes and provisions of this proclamation. The Secretary shall prepare, within 3 years of the date of this proclamation and in consultation with the Secretary of the Interior, a management plan for the monument and shall promulgate such regulations for its management as deemed appropriate. The Secretary shall provide for maximum public involvement in the development of that plan, including, but not limited to, consultation with tribal, State, and local government, as well as community environmental conservation, health, and justice organizations. The plan shall provide for protection and interpretation of the scientific and historic objects identified above and for continued public access to those objects, consistent with their protection. To the maximum extent permitted by other applicable law and consistent with the purposes of the monument, the plan shall protect and preserve Indian sacred sites, as defined in section 1(b) of Executive Order 13007 of May 24, 1996, and access by Indian tribal members for traditional cultural, spiritual, and tree and forest product-, food-, and medicine-gathering purposes. Nothing in this proclamation shall be construed to enlarge or diminish the rights of any Indian tribe as defined in section 1(b) of Executive Order 13007. The Secretary shall prepare a transportation plan that specifies and implements such actions necessary to protect the objects identified in this proclamation, including road closures and travel restrictions. For the purpose of protecting the objects identified above, except for emergency or authorized administrative purposes, the Secretary shall limit all motor vehicle use to designated roads, trails, and, in the Secretary's discretion, those authorized off-highway vehicular use areas existing as of the date of this proclamation. The Secretary shall, in developing any management plans and any management rules and regulations governing the monument, consult with the Secretary of the Interior. The final decision to issue any management plans and any management rules and regulations rests with the Secretary of Agriculture. Management plans or rules and regulations developed by the Secretary of the Interior governing uses within national parks or other national monuments administered by the Secretary of the Interior shall not apply within the monument. Nothing in this proclamation shall be construed to enlarge or diminish the jurisdiction of the State of California with respect to fish and wildlife management. Laws, regulations, and policies followed by the United States Forest Service in issuing and administering grazing permits or leases on all lands under its jurisdiction shall continue to apply with regard to the lands in the monument in a manner consistent with the proper care and management of the objects protected by this proclamation. Nothing in this proclamation shall be construed to alter the authority or responsibility of any party with respect to emergency response activities within the monument, including wildland fire response. The Secretary may carry out vegetative management treatments within the monument, except that timber harvest and prescribed fire may only be used when the Secretary determines it appropriate to address the risk of wildfire, insect infestation, or disease that would endanger the objects identified above or imperil public safety. Recognizing the proximity of the monument to Class B airspace and that a military training route is over the monument, nothing in this proclamation shall be deemed to restrict general aviation, commercial, or military aircraft operations, nor the designation of new units of special use airspace or the establishment of military flight training routes, over the monument.